The Psalter, the ancient hymnal of Israel, gives a magnificent picture of reality. The Psalter’s lyricists and composers wrestled with the nitty-gritty of life in the ancient world. They wrote honest and beautiful songs about their struggles and triumphs. Some of what they wrote seems messy to a purely rationalistic mind, but it all rings true to a full view of reality. I believe the Lord wants us to related to him with our whole beings with the totality of our personalities. But many of us intellectualize Christianity. We approach it much as we would a crossword puzzle in the New York Times. We are satisfied if all the little squares are filled in properly, both horizontally and vertically. If everything fits, matches, goes together, we feel content. However, a vital relationship with the Lord is based on more than head knowledge! He wants to get inside our hearts too—our psyches, our personas. I also believe that intellectualized Christianity is too brittle and rigid for life. Brittle things tend to snap! Modern life is unpredictable, constantly changing, and complex. Both our external and internal worlds keep shifting and moving. Life seems to have a rhythm—work to rest, tension to resolution, and dissonance to consonance. We even tend to think in terms of black versus white and of relative versus absolute. What do we need? What will give us comfort and direction in our complex modern society? We need an adequate view of reality! Intellectual precision, sound doctrine, and impeccable theology are essential, but they are not enough. They are basic blocks in the structure of reality, but they are not the whole building. Those of us who have bought into that system, to the neglect of other crucial areas of our personality, have sooner or later found our lives bankrupt. The Lord isn’t interested in a halfhearted, casual relationship. Hear his compelling command: “Love the LORD your God with all your heart and with all your soul and with all your strength” (Deut. 6:5, NIV). He demands that we love him with our hearts, the set of our love and emotions; with our souls (nephesh), the center of our personalities and self-consciousness; and with our strength, our physical bodies. This is at the fountainhead of living on the basis of the Law. In love the Israelites were to obey the Law because of an awesome respect (fear) and reverence for Yahweh. In the New Testament the Messiah taught us that the whole Law and the Prophets hang on two great commandments–loving God with our whole being and loving our neighbors as ourselves (see Matt. 22:37–40). The love of God was displayed not only in the Law but also on a grand and glorious scaled through his “one and only Son” (John 3:16, NIV). The thrill of the gospel is that it enables us, as never before, to live on the basis of these two great commandments. As we do, we come to know the Lord with our whole beings. 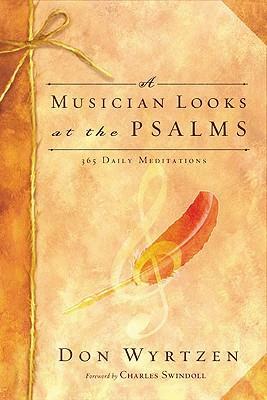 Excerpted from A Musician Looks at the Psalms by Don Wyrtzen (Nashville: Broadman & Holman, 2004), 29-30. Don Wyrtzen is Professor of Church Music at Southwestern Baptist Theological Seminary.